Reasons why being elected to ACTEC is important to you. The American College of Trust and Estate Counsel (“ACTEC”) is an organization of more than 2,500 trust and estate lawyers and law professors from the United States and other countries. ACTEC brings together the top lawyers in the profession to maintain a high quality of trust and estate legal services through mutual education and to contribute to the improvement of the areas of law in which trust and estate lawyers practice. The substantive areas of expertise and experience represented in ACTEC include estate planning and document preparation; probate, estate and trust administration; protective intervention and guardianship administration; transfer tax planning and administration; income tax laws that affect individuals and trusts; elder law and disability planning; charitable planning and issues related to exempt organizations; asset protection planning; employee benefit planning; and fiduciary and probate litigation. Download the Nomination to ACTEC brochure. ACTEC is the premiere estate planners’ organization in the United States, comprised of leading trusts and estates lawyers in all 50 states. International Fellows represent 16 other countries. As a result, the ACTEC directory provides Fellows with the highest quality referral network available – both lawyers to whom a Fellow may refer a client or matter and lawyers from whom a Fellow may receive referrals. ACTEC Fellows are recognized as the leaders in their field, and their services are regularly sought by trust companies, financial planners, investment advisors, family offices, accountants, and other lawyers. ACTEC holds three national meetings each year: a major annual meeting in the spring and shorter meetings in the summer and fall. Each of these meetings includes professional education seminars, substantive committee meetings, and ample opportunities for enjoying the collegiality for which we are named. The CLE at these meetings in the form of seminars and committee meetings is the best CLE available in the practice area of trusts and estates, bringing cutting edge techniques to Fellows and providing interactive opportunities for Fellows to share ideas and experiences. Each meeting also features tours and activities that enrich the ACTEC experience for Fellows and their spouses and other guests and provides them with opportunities to enjoy the camaraderie of others in attendance. 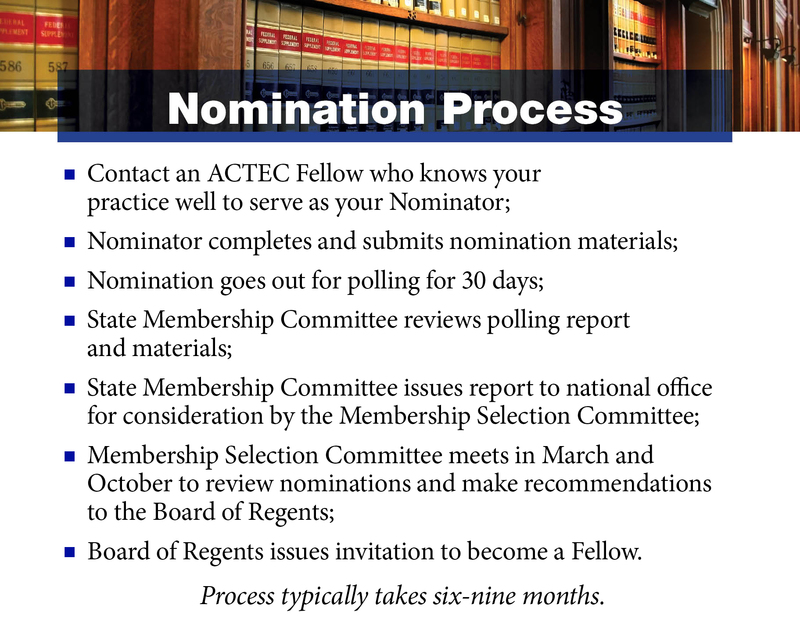 In addition, at various times throughout the year state and regional groups of ACTEC Fellows hold meetings that include significant CLE and social events, and provide more local networking and collegial opportunities. All of these meetings provide Fellows with opportunity to meet and get to know meeting sponsors representatives and to get to know them and get to be known by them. Sponsors include leading national trust companies, bank private wealth managers, valuation appraisers, auction houses, and financial advisors. ACTEC Fellows receive the ACTEC Law Journal, published three times each year, and other publications, including the ACTEC Commentaries on the Model Rules of Professional Conduct, interpreting generally accepted ethical precepts and standards of professional conduct in the unique context of trust and estate practices. A recent collaboration between ACTEC and ALI/CLE results in current, timely, and expert webinars on subjects of interest, including an annual presentation on professional responsibility and ethical issues for estate planning lawyers. The information, archives, and live links on the private side of the ACTEC website are an enormous resource for ACTEC Fellows. Through the ACTEC email practice "listserv," Fellows can participate in lively discussion and exchange ideas, ask questions, and receive answers from other ACTEC Fellows and thus take advantage of the enormous wealth of knowledge and experience of all ACTEC Fellows throughout the United States and internationally. Through the ACTEC website, Fellows can obtain copies of all seminar materials given at annual and regional meetings, which can be of tremendous value when doing research in areas of concern in the estate and trust field. ACTEC Family Estate Planning Guide — The Family Estate Planning Guide offers families educational videos on the fundamentals of wills and trusts to encourage planning. Funded by the ACTEC Foundation. What is a Revocable Trust and Do I Need One? by ACTEC Fellow Professor Mary F. Radford. Understanding Powers of Attorney by ACTEC Fellow Bernie Krooks. 5 new videos will be shared early 2019. ACTEC Trust and Estate Talk — A weekly podcast series that discusses the latest trends and issues in wealth management, and trust and estate law. Please subscribe on iTunes, Stitcher, SoundCloud, Spotify, Google Play or your favorite podcast player. Funded by the ACTEC Foundation. Engagement Letters — ACTEC's 3rd Edition of Engagement Letter, created by the ACTEC Professional Responsibility Committee with the financial support of the Foundation. The Engagement Letters are a critical step in creating professional relationships with clients. The ACTEC Commentaries on the Model Rules of Professional Conduct — Commentaries that continue ACTEC’s tradition of providing guidance particular to estate and trust practitioners. Quicken Templates — The ACTEC Fiduciary Accounting Templates designed for use with Intuit’s popular Quicken checking account and bookkeeping software (but not QuickBooks). Social Science Research Network — SSRN is an electronic archive of abstracts to, and full text reproductions of, scholarly papers in the social sciences, including the study of law (within the Legal Scholarship Network). The Wills, Trust, & Estates Law eJournal-CMBO is available due to a grant from the ACTEC Foundation. Committee members are generally experts in the designated practice area. Committees meet at every national meeting with extensive substantive agendas lasting from two to three hours. Agendas include legislative developments analyzed by Fellows who are experienced observers of Washington, hot topics and new developments in each practice area, and discussion of recent cases and IRS rulings, frequently led by the Fellow who handled the litigation or obtained the ruling. The meetings of the substantive committees are the highlight of every national meeting and are open to all Fellows. From time to time, the College creates a Task Force to address a specific issue of particular importance to the estate planning community. Currently the Financial Action Task Force is working with the ABA, Treasury Officials and Congress to address the issue of lawyers’ roles in combating money laundering and terrorist financing. ACTEC and its Fellows researched and offered opinion to the U.S. Supreme Court in Sveen v. Melin. The position was 8-1 in favor of the position taken by ACTEC. Annually, ACTEC offers comments to the IRS Priority Guidance Plan. In 2010 the ACTEC national office relocated from Los Angeles to Washington, D.C. As a result of the presence and increased visibility of ACTEC in the nation’s capital, ACTEC has been validated and empowered in its willingness and ability to provide technical assistance and support to congressional staffs and Internal Revenue Service and Treasury personnel who have come to appreciate the expertise, practical knowledge, and non-partisan approach of respected trust and estate practitioners. The engagement of ACTEC Fellows in Washington also results in reports back to Fellows of the latest thinking of political watchers as Fellows have tried to navigate the recent uncharted waters of tax change and uncertainty. Another privilege of ACTEC membership is to become acquainted and involved with the College’s 501(c)(3) affiliate, the ACTEC Foundation. The Foundation makes grants that support and encourage legal scholarship related to trust and estate law and supports charitable and educational outreach measures that raise the awareness of rights and opportunities among the public. The College and its committees work closely with the Foundation to identify worthy projects. Fellows are encouraged to serve as judges for the Mary Moers Wenig Student Writing Competition or serve as mentors to participants in the Dennis I. Belcher Young Leaders Program. Every ACTEC Fellow can be involved in the Foundation by providing ideas for Foundation grants and by making contributions to the Foundation that permit it to maintain its level of grant-making. Be approved by your State Membership Committee and State Chair, after all Fellows in the state have reviewed the nomination papers and have been polled on the nomination, and thereafter recommended by the National Membership Committee for election by the Board of Regents of the College. The requirements are modified, as appropriate, for Academic, International and Judicial Fellows.